A fourth battalion will now also incorporate mixed-gender service, leaving only one battalion out of five single-gender. Reserve soldiers in the artillery and graduates of combat services in the corps turned to the IDF Chief of Staff requesting that he refrain from opening another mixed-gender battalion in the artillery corps. The reserve soldiers explained in their letter that if their request was not met, they would be prevented from continuing to serve their reserve duty. 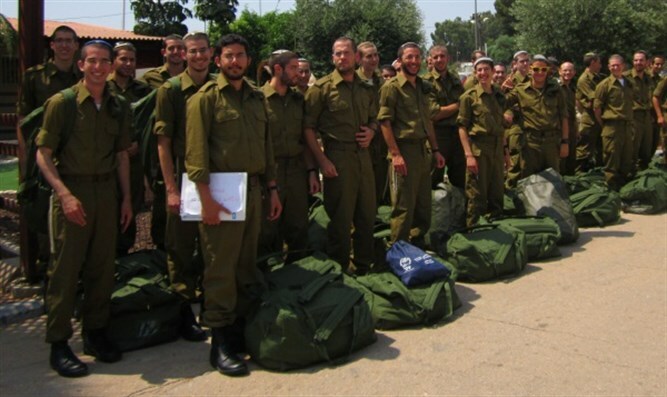 The letter, signed by 70 yeshiva graduates who served in the artillery corps, said, "We are fighters who served in the artillery corps and serve as fighters in the reserves. As religious soldiers, our IDF service was carried out in single-gender battalions." "Joint service with female soldiers is not in keeping with the values of modesty with which we were raised and we believe in. Indeed, the IDF has ensured that only a portion of the artillery corps is mixed-gender, for the sake of the many soldiers who wish to serve in the artillery in single-gender battalions." "To our great dismay, we heard that a fourth battalion (Tiger 405) will now also be open for mixed-gender service, leaving only one battalion out of five in the artillery corps single-gender. We won't relate right now to the difficulty that this will pose to the regular soldiers who aren't interested in a mixed-gender unit, but rather to the difficult problem which this will cause us - namely, a change in the nature of reserve units." The yeshiva graduates also noted that "in a situation in which an absolute majority of the regular artillery corps that supplies the manpower to reserve units is mixed-gender, inevitably the reserve units will also be mixed-gender. We are concerned by the situation in which we'll find ourselves blocked from serving in the reserves - something we do with love and dedication - only because of the decision to form another mixed-gender battalion and not to suffice with the existing mixed-gender battalions." "We appeal to you to stop the process that will block us, many soldiers and commanders, from serving in reserve service, which we see as our duty and right," the letter concluded.